As described in previous posts, our housing development is built around a very large pond. One afternoon, while sitting on a bench at the edge of the pond watching the ducks and geese fly in and out, it dawned on me that the pond would be an ideal body of water on which to sail a model sailboat. I hurried home, fired up my MacBook Pro, Googled ‘model sailboat that sails’ and clicked on the second entry, Tippecanoe Boats. I selected three sailboats that appeared to be suitable for myself and grandsons John, Andrew, and Trent. The T12 Cruiser has a 12-inch long hull with a main and jib sail. 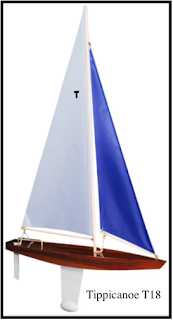 The T15 Racing Sloop has a 15-inch hull and also has a main and a jib sail. The T-Class (T18) Racing Sloop—you guessed it—has an 18-inch hull, a main and a jib sail but also incorporates an adjustable rudder. Each hull is shaped from a solid block of red cedar. I called the 1-800-206-0006 number to order a T15 but the very nice lady taking my order suggested a T18 might be better suited for 12 year-old John. I purchased the T18 kit looking to give both John and myself a new and exciting experience. I also purchased from Tippicanoe a varnishing kit that contains a natural bristle brush, sandpaper, and a glass vial of marine varnish. I also purchased a wire wall mount and a reel (more about the reel later). John and I had no difficulty understanding the instruction sheet packed with the boat even though we were not that familiar with nautical terms. We worked slowly, carefully and enjoyed the construction process. John was fascinated with the varnishing process and was excited that he could give the hull such a deep, translucent shine. He applied four coats of varnish to the hull and had plenty of varnish left over to repair any scratches or dings caused by colliding with the rocky bank of the pond. I was unsure whether or not to glue the mast into the hull so I called the 1-800 number and the friendly and helpful man that answered told me that the mast was typically not glued into the hull. The reason being that an unglued mast makes it easy to take down the main sail and jib for easy transport. I did however make one mistake in the construction process. Despite the caution given in the construction instructions, I broke the brass shaft of the rudder. I immediately called the 1-800 number to order a replacement and the nice lady told me she would have a replacement in the mail that day. I offered to pay for it but she said there was no charge as Tippecanoe wanted to support novice sailors like myself. Once the new rudder was installed, John and I were eager to sail the boat. 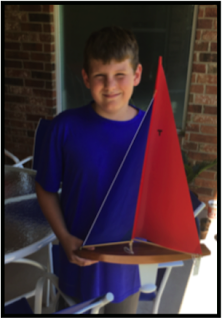 Here is a picture of John and the completed sailboat. We arrived at the pond early the next morning but the wind was too light and inconsistent to get the boat under sail. Here, in central Oklahoma, the wind usually whistles continually at 15 plus knots. As the sun warmed the air, the wind arose and we soon had the boat in the middle of the pond. Swimming in not allowed in the pond and I didn’t have enough confidence in my sailing skills to just release the boat on the upwind side of the pond. This is where the reel comes into the picture. The reel is a wooden rod with a nylon reel wound with light fishing line. The reel revolves on a nylon bearing and is very smooth in its operation. The end of the fishing line is run through an eye hook on the bow of the boat and tied to the mainmast. This creates a long lever arm. When the boat sails as far as you want it to go you give a tug on the line, the lever arm turns the bow of the boat back towards you, the sails tack, and the boat sails right back to its starting position. John sailed the boat across the pond and back twice. The reel worked great and we are excited to have successfully built and sailed the T18. The boat hangs on the wall (using the purchased wall mount) in John’s room and we both look forward to many hours of sailing fun. Our success with the T18 has led me to order a T 15 for grandson Asher and a T 12 for 4 year-old grandson Trent. John is excited to have been given the task of helping the younger boys build and sail their boats.